Meprobamate is carbamate drug with hypnotic, sedative, and some muscle relaxant properties. When used in therapeutic doses, reduction of anxiety rather than a direct effect may be responsible for muscle relaxation. Meprobamate has been reported to have anticonvulsant actions against petit mal seizures, but it does not work well against grand mal seizures. It is used in the treatment of anxiety disorders, and also for the short-term management of insomnia but has largely been superseded by the benzodiazepines. Meprobamate is a controlled substance in the U.S.
What is meprobamate used for? It is most commonly known under the Brand names Miltown manufactured by Wallace Laboratories and Equanil manufactured by Wyeth. It was the best-selling minor tranquilizer for a time, but today it has largely been replaced by the benzodiazepines due to their wider therapeutic index and lower incidence of serious side effects. 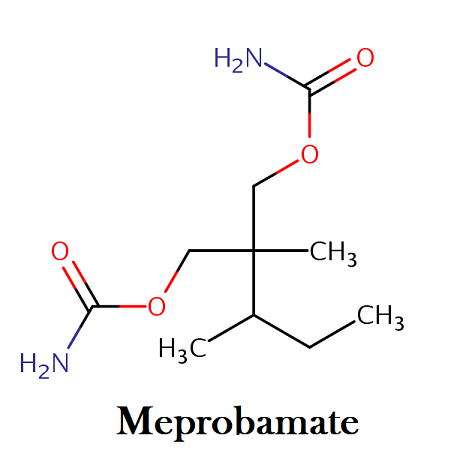 What are Brand and street names for meprobamate? The most common street name for meprobamate is Mother’s Little Helper. Meprobamate belongs to the class of organic compounds known as carbamate esters. These are compounds containing an ester of carbamic acid with the general structure R2NC(=O)OR’ (R’ not H). They are esters of carbamic acids. Meprobamate is categorized as a Schedule IV as defined by the United States Controlled Substances Act. Substances in this schedule have a low potential for abuse relative to substances in Schedule III. Identification: Odorless white crystalline powder. Bitter taste. Solutions in water are neutral or slightly acidic. Stability: Stable in diluted acid and alkali and not broken down in gastric or intestinal juices. Meprobamate was the first anxiolytic agent and along with chlorpromazine initiated the age of psychopharmacology. In the late 1950s, meprobamate was administered to neurotic patients as a less toxic replacement for the sedative effects of barbiturates, chloral hydrate, bromides, ethanol, opium, and paraldehyde. The first report of meprobamate poisoning appeared in 1956. Although initially marketed as a safe sedative-hypnotic with low abuse potential, later reports of serious overdose and addiction indicated that the adverse effects of meprobamate were similar to other sedative-hypnotics. In a French case series of 141 meprobamate intoxications published in 1968, the mortality rate was 5%, resulting primarily from cardiogenic shock. It works as a sleep aid and muscle relaxant, the latter property perhaps a result of the drug’s antianxiety property rather than a direct effect. Meprobamate’s muscle relaxant action improved breathing in the experimental treatment of tetanus. A person’s appetite may get better with the drug, but again as a result of anxiety reduction rather than direct appetite stimulation—an agricultural experiment using meprobamate to encourage weight gain in chickens was unsuccessful. The drug may lessen petit mal epilepsy seizures but worsen grand mal seizures. Meprobamate has also been used against neuroses and attention deficit hyperactivity disorder (ADHD), against a type of muscular discomfort, called myofascial pain, and as part of therapy treating skin lesions brought on by worry. Meprobamate has helped improve stubborn cases of gastrointestinal afflictions, which may have a component of stress. An experiment showed that persons using the drug can fool a lie detector test. Meprobamate’s mechanism of action is not known. It has been shown in animal studies to have effects at multiple sites in the central nervous system, including the thalamus and limbic system. Meprobamate binds to GABAA receptors which interrupt neuronal communication in the reticular formation and spinal cord, causing sedation and altered perception of pain. Absorption. Although the ingestion of large doses of meprobamate may delay GI absorption, peak meprobamate concentrations following the administration of therapeutic doses typically occur about 2 – 4 hours after ingestion. Low water solubility, stability in acid solutions, and reduced gut motility contribute to the formation of drug masses and the subsequent delay in absorption and serious toxicity. Distribution. The volume of distribution of meprobamate is relatively small (0.75 L/kg) with limited plasma protein binding (i.e., 10 – 20%). Arterial-venous differences in the plasma meprobamate concentration may develop during meprobamate overdose. In a study of 35 meprobamate intoxications, the mean plasma meprobamate concentration in femoral arterial blood samples was about 10% higher than in plasma venous samples. Case reports of the meprobamate concentrations in various postmortem tissues suggest that meprobamate distributes preferentially into muscle, heart, and bile with relatively low concentrations in the brain. Metabolism. Meprobamate undergoes biotransformation in the liver by N – glucuronidation of the parent drug and by oxidation of the propyl side – chain to hydroxymeprobamate. The latter metabolite is probably inactive. Meprobamate is a metabolite and prodrug of the muscle relaxant, carisoprodol. Excretion. The kidney excretes about 10% of a therapeutic dose of meprobamate unchanged in the urine. The unaided renal clearance of meprobamate is about 5 – 30 mL/min. The serum elimination half-life of meprobamate is approximately 8 – 12 hours following the administration of therapeutic doses of meprobamate to healthy volunteers, but a case report suggests that the elimination half-life may increase during an overdose. However, the propensity of meprobamate to form concretions during an overdose complicates the interpretation of such increases in serum half-life during meprobamate intoxication. How long meprobamate stays in the system? To fully clear meprobamate metabolites from your system, it’ll take between 1.38 days and 3.9 days. Taking into account maprobamates’10 hour average elimination half-life, meprobamate would remain in systemic circulation for approximately 2.29 days after cessation. The usual adult therapeutic dose is 600 – 1,600 mg daily in 3 – 4 divided doses up to a daily maximum of 2,400 mg. Meprobamate doses in the range of 6 – 10 g produce ataxia and transient hypotension, whereas the ingestion of 10 – 20 g causes significant hypotension and respiratory insufficiency. The ingestion of 30 – 40 g meprobamate produced profound coma, hypotension, and respiratory failure. Meprobamate can cause euphoria and, even though it is a depressant, can have stimulant actions in some circumstances—indeed, mania has been known to occur after a dose. Unwanted actions include a headache, vision trouble, nausea, diarrhea, dizziness, slurred speech, burning or prickling sensations, rashes or other skin outbreaks, severely reduced body temperature, low blood pressure, accelerated heartbeat, fainting, and difficulty in moving around. Users should avoid operating dangerous devices such as automobiles. Tests have measured worsened learning ability, physical coordination, and reaction time while a person is under meprobamate’s influence- although such problems are not found with all tests designed to detect them. In mice the drug promotes amnesia. Experimenters gave the drug to rats for 12 weeks and found it reduced the amount of DNA in brain cells. 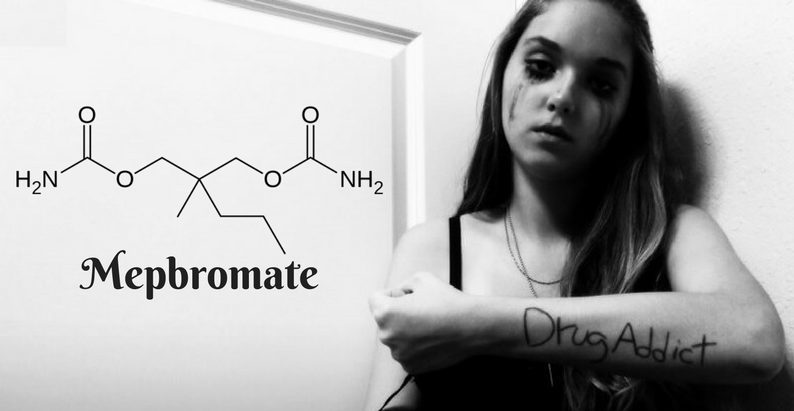 Meprobamate may aggravate porphyria, a blood chemistry disorder that can make people violent and sensitive to light. Although some persons use the drug for years without untoward effect, case reports note uncommon instances where the drug may have caused serious and sometimes fatal blood diseases such as agranulocytosis and aplastic anemia. One disquieting effect of meprobamate is its ability to produce flat brainwave readings, which could cause medical personnel to cease vital treatment in a mistaken belief that the patient has died. During meprobamate’s medical popularity in the 1960s military tests explored the drug’s influence on performance under stress. One test series simulated aircraft pilot situations involving simultaneous tracking of locations in two dimensions, monitoring changes in audio signals, and decoding messages-while exposed to reduced oxygen levels simulating altitudes up to 17,000 feet. 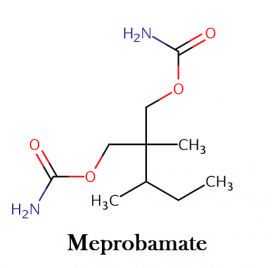 Meprobamate’s abuse potential has been described as similar to benzodiazepine depressants. Dependence on meprobamate can develop if excessive amounts are routinely used. Abuse of this drug is considered a particular risk with addicts to alcohol or other drugs. Addiction typically starts with a prescription for meprobamate to manage anxiety. The patient continues increasing the amounts without medical supervision, and then continues taking it after anxiety has subsided. Some patients feel euphoria after taking this drug, and that feeling can lead to addiction. Once they become physically dependent on the drug, they keep taking it just to feel normal and to avoid withdrawal symptoms. Some people can take sedatives like Miltown on an occasional basis and not become addicted –for example, the drug has been popular among musicians as a remedy for stage fright. Others who experiment with these drugs rapidly become addicted to them. Some addiction experts believe that it is more dangerous to experiment with minor tranquilizers like Miltown than major ones like Thorazine because the minor ones have few side effects, giving the impression they are safe. About 44% of those who entered treatment for addictions to sedatives and tranquilizers in 2007were white females, 48% were over 35 years old, and 29% had twelve or more years of education. Almost 60% were using these drugs daily, and 71% were using them in combination with other drugs. Case reports suggest that the chronic use of high meprobamate doses causes withdrawal symptoms following the abrupt cessation of use. The clinical features of meprobamate withdrawal are similar to barbiturate withdrawal, particularly when the daily dose of meprobamate ranges from 3 – 6 g.
Signs of withdrawal of patients ingesting high doses of meprobamate include insomnia, nausea, vomiting, tremors, anxiety, muscle twitching, headache, ataxia, delirium, and seizures. Meprobamate produces a clinical picture of CNS depression that is similar to those of other sedative hypnotic drugs including phenobarbital. Symptoms range from nystagmus, dysarthria, ataxia, and confusion to deep coma, hypotension, apnea, and pulmonary edema. Serious complications of meprobamate overdose include profound hypotension, shock, hypothermia, and respiratory failure. Because of depressed myocardial contractility during meprobamate intoxication, cardiogenic pulmonary edema may develop, particularly following the administration of substantial amounts of IV fluids. In a review 57 meprobamate overdoses from the files of a clinical laboratory, the most common physical signs associated with meprobamate intoxication were dysarthria (21%) and hypotension (18%) followed by tachycardia, ataxia, miosis and mydriasis, nystagmus, respiratory depression, hallucination, seizures, dysconjugate gaze, and hypothermia. Fluctuating levels of consciousness may result from the delayed release of meprobamate from concretions in the stomach; sudden deterioration may occur after initial improvement because of the release of meprobamate from these concretions. Hypotension usually correlates to the depth of coma, but occasionally hypotension develops during the lighter stages of coma. Convulsions are more common in the recovery phase of meprobamate overdose compared with other sedative-hypnotic drug overdoses. In mice nicotine reduces the time they are physically uncoordinated after a meprobamate dose, just as we might expect when stimulant (nicotine) is taken after a depressant. In contrast, injection of marijuana’s main active component THC increases the power of a meprobamate dose in animals. Meprobamate has been used in combination with dextroamphetamine for human weight loss, a combination that had uncertain effectiveness but that produced fewer unwanted actions than dextroamphetamine alone. Alcohol and meprobamate each have similar unwanted effects, and in that regard using both together can be the equivalent of taking extra doses of one or the other. Does meprobamate show up on drug tests? If used alone, standard drug tests can’t detect meprobamate.